The brakes are important for the overall safety of your vehicle. Brake issues are something that should not be ignored either. The brake pads, brake rotors, system, and fluid levels should all be inspected as well. Having a properly maintained vehicle should also include checking the brake system completely. Ignoring the brakes can lead to more issues in the long run for you and your vehicle. You may notice a hot or sharp odor when the brakes start to overheat. If this is a common smell, pull over immediately in a safe place. Also make sure that you check the parking brake. Sometimes these are accidentally applied. The brakes will then need time to cool. There can be a larger issue if you choose to ignore a brake issue. Also be aware for any smoke that comes from under your vehicle. Keeping the vehicle and brakes maintained will help the overall efficiency of it as well when you drive. The vehicle may also feel like it bounces or has vibrations. When stopping short, this issue can be very noticeable. Any issue with how the vehicle handles should be inspected immediately. This can help prevent further damage to the parts and components. The brake issues the vehicle may have are important because they allow you to stop. Without proper brakes, you will have an increased chance of having an accident when you drive. 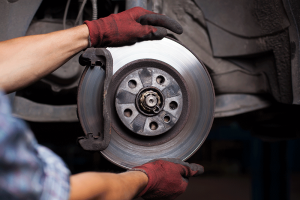 The brakes should be inspected on a regular basis for your vehicle. You can check with what the manufacturer recommends, or we can recommend a schedule for the brakes as well. By following these, you can help to save on wear and tear from your vehicle in the long run. You will also help to increase the safety and reliability of it as well.